Beverly Ann (Johnson) Schmidt, 81, of Norwood Young America, died Tuesday, Aug. 16, 2016, at Ridgeview Medical Center in Waconia. Casket bearers were Chad Feltmann, Josh Schmidt, Alex Schmidt, Justin Thaemert, Orrin Herrmann, Mike Moffett, Lindsay Schmidt and Emily Schmidt. Beverly Ann (Johnson) Schmidt was born Aug. 16, 1935, in Minneapolis, the daughter of Elof and Alice (Olson) Johnson. She was baptized and confirmed on Aug. 29, 1954, at Grace Lutheran Church for the deaf in Minneapolis. She received her education at a school in Minneapolis. On Sept. 17, 1955, she was united in marriage to Arthur Schmidt at Aldrich Presbyterian Church in Minneapolis. They made their home in rural Norwood Young America, where they farmed together. Their marriage was blessed with two sons, Dale and Larry. The couple shared over 60 years of marriage. In addition to being a loving wife and mother, Mrs. Schmidt was a homemaker. 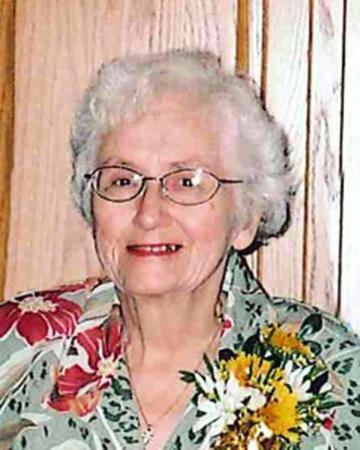 She was a member of St. Paul’s Evangelical Reformed Church in rural Hamburg. Mrs. Schmidt was always happy, having a smile for everyone, and loved spending time with her husband Arthur. The couple enjoyed traveling and some of their memorable trips were to Hawaii, Mexico and California. They treasured the times spent at Mrs. Schmidt’s family’s cabin. She enjoyed cooking, canning, sharing recipes and visiting with people. She cherished the time spent with her family and friends. She passed away on her birthday, Tuesday, Aug. 16, 2016. She is survived by her husband, Arthur Schmidt of Norwood Young America; sons, Dale (Mavis) Schmidt of Green Isle and Larry Schmidt (Melody Imholte) of Annandale; grandchildren, Lindsay Schmidt, Alex Schmidt, Emily Schmidt and Josh Schmidt; great-grandson, Easton; sisters and brothers-in-law, Joyce and Harold Moffett of Sauk Rapids and Marilyn and Richard Rosin of Bloomington; great-aunt, Esther Gunderson of Becker; nieces, nephews, other relatives and many friends. She was preceded in death by her parents, Elof and Alice Johnson; and brother-in-law, Herbert Schmidt. Arrangements were with the Paul-McBride Funeral Chapel in Norwood Young America. Online obituaries and guest book are available at www.hantge.com.